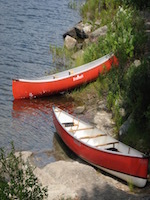 Canadian Canoe Routes • View topic - It is kijiji canoe season again! It is kijiji canoe season again! Post subject: It is kijiji canoe season again! No amazing deals yet but there are a few nice Kevlars posted the last week in the Ottawa area. This one is really nice - recently refurbed wood. Probably a reasonable price at $1450. Post subject: Re: It is kijiji canoe season again! Oh there is more pictures up for the Scott now from when I first looked - yeah definitely needs a lot of work! That's not even worth half that in my opinion. This one's gone. Surprised it lasted so long! Last edited by open_side_up on April 4th, 2018, 8:16 pm, edited 1 time in total. First one is very nice, a little too heavy for portaging, but a sharp looking canoe for the cottage. First one is gone now. Here is one I am looking at. A Bluewater Saugeen 16/6. Does anyone have any experience with one of these? It looks like a prospector style to me. I am looking for a family tripping canoe. The Bluewater info I could find online indicated these were made with shoe keels which wouldn't be my choice unless they are very low profile. I'd also prefer a symmetrical canoe which I'm not sure if the Saugeen's are? Pretty sure the Saugeen series from Bluewater is symmetrical. Bluewater used epoxy resin in their lay-ups vs. vinyl-ester or polyester, which in the minds of many (mine included) make it a superior hull. Shoe keels are basically a wear-strip along the length of the hull, no? ... so inherently low profile. Less rocker than a traditional prospector I believe. This is a quality boat at a great price. I would grab it quickly! The seller sent me a photo of the bottom. To me it looked like a low-profile keel but more than just a wear strip. If it wasn't for that I would have jumped at it. It does look like a good option for someone who doesn't mind the keel. open_side_up, I must be a bit out of it, I thought most composite layups would use epoxy? Although there may be more, Souris River and Bluewater are (were?) the only two canoe makers that I am aware of that use epoxy resin. Just checked the Swift site and they use vinyl ester resin which is a polyester/epoxy hybrid and while stronger than polyester it's not as strong as epoxy. That first canoe was a beauty. Some, not all Bluewater canoes were laminated with Epoxy Resin. Some H2O laminates are epoxy too.The H2O Canadian is a carbon copy of the Bluewater Saugeen. Its an OK canoe. A good all rounder. They pop up frequently in the $750-1250 range. The Scott is now down to $750 but still overpriced given the required repairs. Yeah I contacted him at 750 and said "sorry dude, still way overpriced". He replied back and said "so make me an offer"
I'm afraid even at 575 he's out of touch with reality on that boat.